Overview - Experience the antics of two outcasts, Jack Black (School of Rock) and Mos Def (The Italian Job), as they attempt to save the local video store in Be Kind Rewind, an outrageous and offbeat comedy from Academy Award®-winning writer/director Michel Gondry (Eternal Sunshine of the Spotless Mind). Amateur film director Mike (Def) must find a way to save the business after his magnetized friend, Jerry (Black), erases every movie in the store. Using an outdated video camera and their own special effects, the two embark on an adventure to remake all of the movies, from Ghostbusters to Driving Miss Daisy, turning the two town misfits into local celebrities. When an aging businessman named Mr. Fletcher (Danny Glover) leaves his VHS-rental shop in the hands of a clerk named Mike (Mos Def), he gives the young man a single instruction: to keep a blundering conspiracy theorist named Jerry (Jack Black) out of his store. When Jerry’s fear of microwaves and the government leads him to sabotage a local power plant, an electrical mishap magnetizes his body. Vomiting uncontrollably, Jerry finds his way into Mr. Fletcher’s store and inadvertently erases all of the VHS tapes on the shelves. As customers begin returning a slew of blank tapes, Mike scrambles to fix the situation before Mr. Fletcher comes home. With a bulky camcorder, Jerry, and a local named Alma (Melonie Diaz) at his side, Mike reshoots the movies and rents the new “Sweded” versions to customers. Bracing himself for the worst, the trio of clerks are shocked when people begin to enjoy their low-budget recreations more than the original films. At its heart, ‘Be Kind Rewind’ is actually a delightful comedy about a forgotten jazz legend named Fats Waller, a local community’s indomitable spirit, and an old man struggling to find his way in a modern world. When Gondry focuses on these more personal elements, his film sizzles and delivers a genuinely touching story about down-on-their-luck losers overcoming impossible odds. In fact, when Mos Def and Danny Glover frequent the screen, everything worked for me -- I really enjoyed watching Mike take control of his situation as Mr. Fletcher fought against a naïve belief that everything would come together in the end. However, the moment Gondry turns his attention to Jack Black, the otherwise quaint modern fairytale becomes a vehicle for the comedian’s usual schtick. 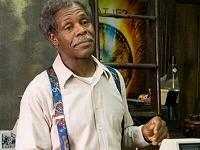 Granted, Black injects the film with some decent laughs, but he also creates a thematic conflict. As a result, Gondry seems to be making two separate films: a brash farce with Black and a subtle comedy with Def. The patchy outcome feels uneven and inconsistent at times, subverting the better material Gondry, Black, and Def have packed into the story. An ambiguous romance between Alma and Mike isn’t given any room to breathe, Mr. Fletcher’s fascination with Fats Waller isn’t properly explored, and his rivalry with another video store owner is completely overlooked even though it becomes a crucial component in the film’s climax. To make matters worse, Gondry’s clever imagination has been undermined by an all-too-revealing theatrical trailer. Anyone who’s seen the film’s preview has also seen almost every “Sweded” short the director created for the film. Ruined is the entire ‘Ghostbusters’ remake, the best ‘Miss Daisy’ bits, and many of the briefly-glimpsed remakes that fill ‘Be Kind Rewind’s Swede montages. I actually think I would’ve liked the film a bit more had I known nothing about it. Even so, I still think ‘Be Kind Rewind’ is worth watching. Anyone who isn’t annoyed by the disjointed tonal issues I had with the film will probably really enjoy their time with the eclectic and amiable natives of Passaic, New Jersey. However, since Gondry has proven he can make brilliant, mind-bending films, this one feels like an ordinary waste of a more intriguing premise. With a tighter script, a few more leftfield surprises, and fuller character development, ‘Be Kind Rewind’ could’ve been the film promised by its theatrical trailer. For a flick focused on a pair of bumbling losers shooting low-budget short films, ’Be Kind Rewind’s 1080p/VC-1 transfer looks surprisingly good. While Gondry uses an even bleaker palette than he did in ‘Eternal Sunshine of the Spotless Mind,’ primaries (particularly reds and blues) have a distinct pop that keep the image lively and stable. Contrast is also strong, boasting inky blacks and a pleasing vibrancy that isn’t hindered by crushing or blooming. Better still, sharp details keep the picture looking fresh and highlight the movie posters, hand-written signs, and antiques cluttering Mr. Fletcher’s video store. Best of all, the transfer isn’t cluttered with noise as I expected -- purists and fans won’t suffer at the hands of significant artifacting, edge enhancement, print damage, or the image-diluting DNR (Digital Noise Reduction) that’s popped up on other New Line releases. In fact, compared to the bland and blocky standard DVD, this Blu-ray release is a godsend. There are a handful of intentional visual hiccups -- Gondry employs a few soft shots, contrast inconsistencies, and delineation discrepancies to augment the mood of the film -- and the footage of Mike and Jerry’s “Sweded” productions looks decidedly low-rent, but the remaining scenes in ‘Be Kind Rewind’ have been meticulously refined to produce a noteworthy transfer. As it stands, anyone who enjoyed Gondry’s patchwork story and his protagonists’ surreal shenanigans will fall in love with this pleasant high-def presentation. New Line has put together an exciting DTS HD Master Audio 7.1 surround track for ‘Be Kind Rewind’ that pushes past the film’s talkative soundscape with busy ambience and realistic acoustics. First and foremost, I was surprised by the depth of the LFE channel since I assumed the film would be fairly quiet and subdued. Low-end bass pulses frequently enhance scenes that involve Jerry’s magnetism, mechanical elements like construction equipment, and the musical score itself. Those with 7.1 audio set-ups will notice how the additional rear speakers really help recreate the fullness of bustling city streets and crowd chatter. When the filmfans of Passaic got together to watch Mike and Jerry’s Fats Waller short, my home theater became their small makeshift auditorium. Voices were placed at precise positions in the soundfield, transparent pans allowed the camera to convincingly weave through the crowd, and sound effects naturally echoed within the confined space. I do have one nitpick, but I thankfully didn’t find anything else that significantly detracted from the audio. While dialogue was crisp and well-prioritized for the most part, I found line clarity was a bit too dependent on where scenes were shot. The ‘Ghostbusters’ library and ‘Robocop’ underpass scenes are occasionally overwhelmed by other elements in the soundfield, leaving the actors’ words slightly muddled. Regardless, ‘Be Kind Rewind’s audio track is quite impressive and does a nice job recreating the theatrical experience. 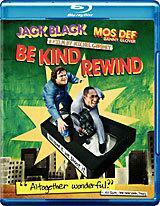 While the DVD release of ‘Be Kind Rewind’ only included two extras, the Blu-ray edition packs in a generous helping of exclusive content (detailed at length in the next section). Unfortunately, all of the special features are presented in 480i/p standard definition. Passaic Mosaic (SD, 10 minutes) -- One of the best surprises of ‘Be Kind Rewind’ is documented in this charming little featurette: Gondry culled actual residents of Passaic, New Jersey when he was casting supporting roles in his film. This short not only serves to explore the history of Passaic, it includes interviews with the director, the local amateur performers, and other key members of the cast and crew. Theatrical Trailer (SD, 3 minutes) -- Had I not seen this all too revealing preview before catching ‘Be Kind Rewind’ in theaters, I would’ve probably enjoyed the film a bit more. It’s mistake is giving away most of the best “Sweded” bits. ’Be Kind Rewind’ doesn’t boast the consistent comedy or tight script I hoped Gondry would deliver, but it still manages to offer fun subplots and charming characters. While this one won’t find a home on my shelf, I’m pretty sure other people will find a lot to enjoy. 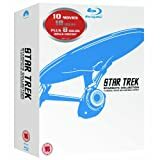 Fans of the film will really enjoy this Blu-ray edition from New Line. Not only does it supply a generous selection of exclusive supplements, it offers an excellent video transfer and DTS HD MA audio track. So give it a spin and let us know what you think!